Historical consciousness has been part of Texas Methodism from its earliest days. When writing about the establishment of the Texas Conference on December 25, 1840, Bishop Beverly Waugh made reference not to Christmas, but to the 1784 founding of the Methodist Episcopal Church. The editors of the Texas Christian Advocate solicited memoirs from pioneer Texas Methodists for publication. The existence of an East Texas Conference historical trunk can be documented as early as 1866. One of the most important steps in preserving Texas Methodist history occurred on February 24, 1909 with the organization of the Texas Methodist Historical Association. 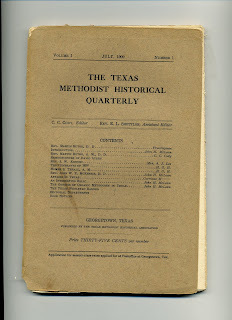 By the following July the TMHA was able to produce volume 1, #1 of the Texas Methodist Historical Quarterly. The editor was C. C. Cody of Southwestern University. The assistant editor was E. L. Shettles of the Texas Conference. The first volume provided a wealth of historical treasures and set the pattern for the subsequent volumes. After an introduction by TMHA president John McLean, Claude Cody wrote a biography of Martin Ruter, Mrs. A. J. Lee (John Wesley Kenney's daughter) provided a biographical sketch of her father. Hamilton G. Horton, who had been admitted O. T. in 1858 contributed sketches on Homer Thrall and the 1838 itinerants. There were also reprints of a David Ayres Advocate memoir and of Bishop Joshua Soule's January, 1846, episcopal address delivered in Houston. McLean contributed an article on J. W. P. McKenzie, under whom he had studied. An unsigned article on the Texas Wesleyan Banner was also included. Membership in the TMHA was $1 per year. A life membership could be purchased for $25. a life membership was also awared to those persons who donated manuscripts, diaries, scrapbooks, etc. judged to be worth $25. The Association was able to publish only six more issues of the Quarterly, ending with Volume 2, #3. The seven issues that were published constitute one of the most important sources about Texas Methodist history. It may be difficult for some to think of Houston as a crude town of log buildings and muddy streets, but that’s how travelers described it in its early years. Some of the best descriptions come from a Presbyterian missionary, William Y. Allen, who lived in Texas from 1838-1842. When missionaries go to unchurched lands, they often see the virtue of cooperating with missionaries from other denominations rather than engaging in doctrinal debates. Such was the case with Rev. Allen and the Methodist missionaries who came to Houston. Allen cultivated a close friendship with Littleton Fowler with whom he served as Chaplain in the Congress of the Republic of Texas (Fowler in the House, Allen in the Senate) and also formed a high opinion of Robert Alexander and Martin Ruter. Sabbath, June 3, Preached at the Navy Yard (Galveston) 10:30 A. M. Said to be the second ever preached on the island. . . .nearly devoured by mosquitoes at night. Sabbath, June 10. Preached twice this day (in Houston); much liberty in the evening service. . .a falling off in the size of the congregation as the weather gets warmer. Friday, June 15 Spent the afternoon in opening and distributing a box of Bibles and Testaments, one hundred of each in the box; a donation from the A. B. Society, May the Holy Spirit, whose sword the word is, guide in its distribution. . .
Monday, June 18 Had a long conversation with a professed Deist; said he believed in one God, that he loved him and worshiped him, that he admired the Bible for its morality, etc. He admitted that he did not wish his children brought up in the principles of Deism. I fear he trying to believe a lie. Tuesday, June 19 Had a long talk with an eccentric man, who thinks he has made some singular discoveries in relation to the plan of salvation, faith, etc. I rather suspect him of egotism, inclined to Campbellism. He seems to like to hear himself talk. Allen left Texas in 1842 and in 1845 became president of his alma mater, Centre College. He served in that post for fourteen years and then took pastorates in Kentucky and Indiana. One can read more of Rev. Allen’s diary at the link which follows. As this column has previously noted, there were strong disincentives for circuit riders to marry. The meager pay, long absences from home, and frequent changes of appointment made married life difficult. On the other hand, there were powerful incentives for marriage in the Republic of Texas. Immigrants to Texas between March 2, 1836 (the date of the Declaration of Independence) and October 1, 1837 received a second class headright of 640 acres. Heads of households, i.e., married men, received twice that amount, 1,280 acres. Those who arrived between October 1, 1837 and January 1, 1840 received 320 and 640 acres respectively. The first three officially commissioned missionaries to Texas, Martin Ruter, Robert Alexander, and Littleton Fowler, understood land law as well as the other immigrants to Texas. Ruter was only in Texas from November 1837 to May 1838, but in that brief time, he obtained two land claims. Alexander and Fowler, both unmarried when they volunteered for the Texas Mission, married within a year of their arrival. Not only did they marry and thus double the amount of land to which they were entitled, both men married women who brought prospects of even more land with them. Robert Alexander was first. He entered the Republic of Texas in September, 1837, thereby beating the October 1 deadline. Fowler barely missed it, arriving in October, 1837. Alexander married Eliza Ayres, daughter of David Ayres, land speculator par excellence, in January 1838. ( See post for 1/29/06) Fowler married Missouri Porter, a Nacogdoches widow, on June 23, 1838. Mrs. Porter thus brought her deceased husband’s land claims to the marriage. Mrs. Porter was widowed under unusual circumstances. Her husband, Dr. J. J. Porter, had been killed by a chained bear near the Old Stone Fort in Nacogdoches. Lewellen Campbell presided over the wedding ceremony. Campbell had also volunteered for the Texas Mission and came to the Republic where he preached in Houston and East Texas. About the same time as the June wedding, the MEC bishops attached the Texas Mission to the Mississippi Conference. In December, much to his disappointment, he was appointed to New Orleans and spent the rest of his career in the Mississippi Conference. He also had Texas land claims via marriage. He married Sybil Ruter, daughter of Martin Ruter, and thus participated in Dr. Ruter’s estate which included the two claims mentioned previously. Many of Fowler’s letters to Mrs. Porter are preserved in the Fowler Collection at Bridwell Library, Perkins School of Theology, SMU. The courtship by correspondence was necessary because Fowler had spent the months leading up to the wedding in Houston lobbying the Texas Congress to grant a charter for a Methodist school and appropriate land for the support of that school. The letters that have been preserved reveal a loving attitude toward Mrs. Porter. Other letters in the collection such as those he wrote en route to New York City as a delegate to the MEC General Conference of 1844 reinforce the observation that he was a devoted, loving husband. After Fowler's death in 1846 Missouri married for a third time. Her last husband was the Rev. John Woolam. "A Joseph's Coat of Lives," a play Ann Reeves has written about the life and ministry of Rev. Elijah L. Shettles, will be performed at FUMC Pittsburg (in the Sanctuary Rev. Shettles built 100 years ago) June 28, 30, and July 1, at 7:30 each evening. All are invited to attend. If you call the church office (903-856-2839) or email us (rheyduck@txcumc.org) with the number in your party and the night you plan to attend, we can make sure there is enough space. This is another presentation in a series of special events marking the congregation's sesquicentennial this year. Most Americans probably associate the wave of Italian immigration in the late 19th and early 20th centuries with the cities of the northeastern United States. While it is true that a majority of Italian immigrants did go to that region, there was also enough Italian immigration to Texas to justify the establishment of an Italian mission effort. The term "Italian Mission" appears in the Texas Conference Journals as early as 1903 with an appointment to Galveston. In 1905 it is listed as moving to Beaumont. Thurber, in the Northwest Texas (now Central Texas) Conference, was home to about 3,000 Italian coal miners in 1909 according to the Texas Christian Advocate. The most successful Italian mission, though, was to Italian farmers in the middle Brazos Valley in Brazos, Grimes, Robertson, and Burleson Counties. Much of that success was due to the efforts of the Rev. Francisco Zito who was received into the Texas Conference by transfer from the Central Texas Conference in 1915 and appointed to the Navasota Italian Mission. Zito had been converted at a MEC mission in Florence, Italy, in 1891. He was ordained in that denomination and served as a missionary in Florida and Louisiana before coming to Texas. Zito's main base of operation was the Italian church in Bryan. He recruited another convert, Bruno Martinelli, to the ministry and turned the church over to him while he took an extended leave of absence to return to Italy. He died while on that leave in Rome. One of the outstanding successes of Texas Methodism is the Methodist Children's Home of Waco. Today it is recognized as one of the premier institutions of its kind, but its road to excellence was not without difficulty. One unfortunate episode in its history was the typhoid epidemic of 1910 in which fifty-one children at the Orphanage contracted the disease. The Orphanage had been founded by the Northwest Texas Conference in 1890. Part of the motivation of its founding was to bring together the two factions that were warring over the Holiness Movement. In 1891 the board hired W. H. Vaughan as the administrator. He began raising money, and in 1894 David Harrison became the first resident. The Orphanage grew rapidly through the 1890's and 1900's. The other MECS conferences in Texas joined the Northwest Conference in providing support. Abe and Louisa Mulkey adopted the Orphanage as their project. Abe Mulkey was perhaps the most famous revivial preacher of the era. Louisa was a musician. Practically every week of the year the Mulkeys preached a revival service, and the offering one of those nights went to the Orphanage. Texas churches also began the practice of collecting a Christmas offering for the children in Waco. By the time Vaughan left the administration of the Orphanage in 1908, it had grown to a 33 acre site with two brick buildings and a cottage. It also had a 169 acre farm nearby which supplied much of the children's food. Vaughan also left the Orphanage debt free with cash in the bank, a remarkable feat! In 1908 John H. McLean was appointed administrator. (See post for April 1, 2007) McLean's tenure at the Orphanage lasted only four years and was marked by a dreadful epidemic of typhoid fever. Americans of the era were well acquainted with epidemic disease. The bacterium that causes typhoid fever, Salmonella typhi, was transmitted by ingesting food or water. The disease typically induced fevers of 104 degrees in its victims. Delirium was a common symptom, and recuperation generally took at least a month. In 1910 the US mortality rate for typhoid fever was 25 deaths/100,000 population. In the next thirty years chlorination of municipal water supplies and barring carriers from restaurant employment brought that figure down to zero deaths. McLean's tenure at the Orphanage proved to be brief as compared to other administrators before and after him. (Vaughan 1891-1908, W.F. Barnett 1919-1933, Hubert Johnson 1933-1966). Some of McLean's difficulties were self-inflicted. He hired his son-in-law and put him in a position of responsibility for which he was not suited. In 1912 Bishop Mouzon appointed McLean to Wolfe City.